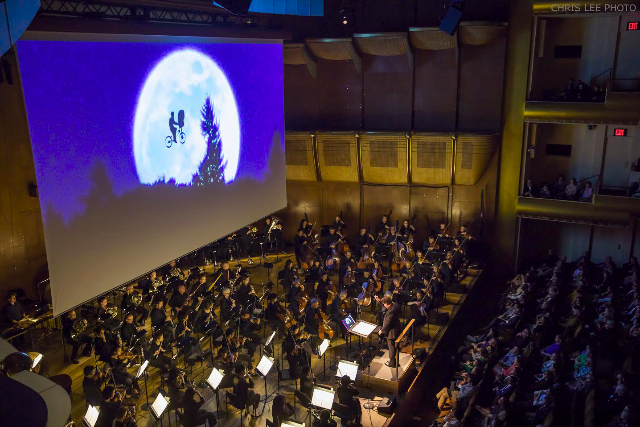 In this latest installment of the New York Philharmonic’s extraordinarily successful series fusing live performances with film classics, Steven Spielberg’s E.T. was featured on a huge screen accompanied by the orchestra. Heavy rain and gusty winds did not keep the audience away; the sold-out house was packed with adults on their own and families with very young children. Almost preternaturally quiet during the film, these wide-eyed kids bounced with excitement..
E.T. is a timeless love story about two lost little ones – Elliott, a young boy from a family split by divorce, and E. T., a tiny alien left behind when his spaceship took off without him. Both long for the home they have lost. They are saved by each other and their tender, trusting friendship. The film offers something for everyone. There is magic, mystery, and melodrama. There is also a commentary – sometimes a sardonic one -- on the effects of family breakdown. Mostly though, there is a pervasive sense of wonder at the beauty of love and kindness and the transcendent power they have to heal sadness and alienation. Any adult in the audience who had experienced grief, disappointment, or loss of faith in someone or something could feel it. Hearing the orchestra live brought out the greatness of John Williams’ score. His rich orchestral palette – especially the luxuriant strings, the horns, the exquisite delicate touches featuring winds, piano, and even a harp – both reflected and evoked feelings and tracked the visuals so well. The last fifteen minutes of the film – when E.T., believed to be dead, comes back to life and is spirited away by Elliott and the other boys to the spaceship that has returned to rescue him – is truly operatic. This is a music drama -- Wagnerian in scope and sometime in sound. There is total synergy between the visual and the aural. The sound tapestry made up of musical motives is evocative, forward moving, and finally celebratory. When the horn fanfare resounds as the spaceship lifts off and a rainbow fills the sky, the effect is thrilling. John Williams has had a huge influence on 20th and now 21st century cinema. His greatest contribution is his use of symphonic music in film. He has been extraordinarily prolific, scoring over one hundred films. For the score of E.T., he won an Oscar, a Golden Globe and a Grammy award. All told, he has won five Oscars, four Golden Globes, three Emmys and an astounding twenty-three Grammys. He is also the first composer to receive the American Film Institute’s Life Achievement Award. The challenge of integrating a large orchestra with a finished film is surely logistically daunting and our conductor, David Newman, was the right man for the job. A composer in his own right, he has made rather a specialty of conducting music to film including Raiders of the Lost Ark in March in Philadelphia and E.T. in venues as disparate as The Royal Albert Hall in London and the Hollywood Bowl. The orchestra played powerfully yet always sensitively. The popular New York Philharmonic’s film program is a clever way to entice families to experience live music in a concert hall. In past years, offerings have included The Godfather, West Side Story, and Manhattan. Next autumn, the Philharmonic will present two Star Wars films and, in the spring, Amadeus. A screening accompanied by the Boston Pops will be presented at Tanglewood this summer.